If you were worried the end of the Resident Evil franchise (at least until the inevitable reboot) also meant the end of Milla Jojovich and husband Paul W.S. Anderson making video game movies, you can relax! It was a few years ago that we broke the news of Anderson's intention to adapt Capcom's Monster Hunter video game series, and of course, he brought along Jojovich to star, alongside Ong Bak's Tony Jaa. 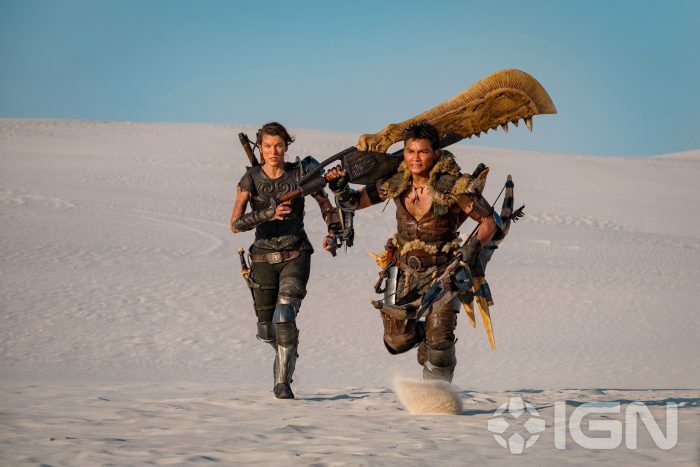 IGN has revealed the first official look at Monster Hunter, featuring Jojovich and Jaa, carrying weapons bigger than their entire bodies. Jaa plays Hunter, the main character of the video game franchise, whose sole task is hunting and trapping dangerous monsters. Jojovich plays an original character, Captain Natalie Artemis, a soldier for the United Nations. Fans of the game will recognize the weapons and armor as being lifted straight from it. The film also stars Tip "T.I." Harris, Ron Perlman, Meagan Good, and Diego Boneta. Here's the synopsis: Behind our world, there is another: a world of dangerous and powerful monsters that rule their domain with deadly ferocity. When Lt. Artemis (Milla Jovovich) and her loyal soldiers are transported from our world to the new world, the unflappable lieutenant receives the shock of her life. In her desperate battle for survival against enormous enemies with incredible powers and unstoppable, revolting attacks, Artemis will team up with a mysterious man who has found a way to fight back. Monster Hunter is expected to open next year.